We know what a Devin Nunes-led investigation into possible Russian compromise looks like. Just in December, after all, the House Intelligence Committee released their investigation into Edward Snowden. Using the Snowden investigation as a guide, we know that HPSCI believes that if there’s an ongoing investigation, it should avoid speaking to anyone who knows evidence first-hand. It can instead rely on the impressions of people who don’t like the target of the investigation, as HPSCI did for claims that Snowden went to a hackers conference in China. It can also avoid reviewing official records, including public school records or even official Army records. Rather than do that, it may rely on imprecise citations of public reporting, interpreted in the light designed to be most damning. Any lies told — such as Snowden’s cover story that he’d be undergoing epilepsy treatment or Mike Flynn’s lies to Mike Pence — are themselves evidence of the worst possible guilt. Numbers are interpreted in the most damning possible light, even if more recent and informed numbers suggest something far less damning; those damning numbers came, in Snowden’s case, from a decision made by former DIA Director and recently fired National Security Advisor Flynn to assume any contact involved potential compromise. Very importantly, HPSCI’s standard is that if anyone alleges contact between Russians and the target of an investigation, they should believed, even if that person is not in a position to know first hand. According to HPSCI standard, it is permissible to rely on dubious translations of Russian comments. That’s the standard a Devin Nunes-led investigation holds to — or at last held to, with Snowden — before it deems an American citizen a traitor (irrespective of the very specific requirements of a treason charge). Now, you can certainly argue that that’s a horrible standard for an intelligence committee investigation into allegations that an American citizen is spying for Russia. I have made that argument myself. But that is the standard HPSCI very recently set for serious allegations of possible intelligence compromises involving Russia. 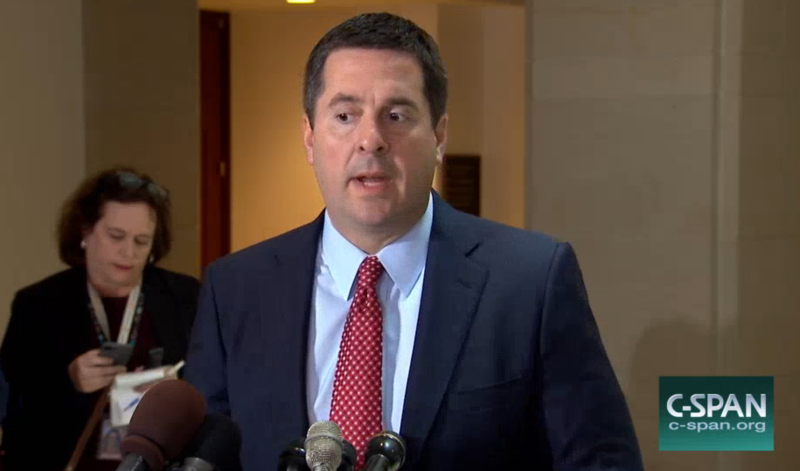 And if Nunes applied the same standard to Trump’s associates he applied to Edward Snowden, then clearly the allegations in the Trump dossier should be presumed to be true (again, I’m not advocating for this, I’m talking about what would happen if HPSCI applied the same standard). That would mean Carter Page’s contacts with Kremlin Internal Affairs official Diyevkin would count as evidence of a contact. Carter Page’s other contacts were not named. Michael Cohen’s, which were alleged to be even more inflammatory, were done with Russian Presidential Administration figures working under cover, but would seem to meet the Nunes HPSCI standard. Paul Manafort’s contacts were with Ukrainians. Finally, if HPSCI applied the same standards they did with Snowden, then the claims from Sergei Ryabkov that there were discussions before the election should amount to sufficient evidence to substantiate the claim. Devin Nunes invoked McCarthyism in insisting his committee shouldn’t just investigate American citizens without evidence. But he apparently extends that standard differently to men on whose transition team he served. Authoritarians and their followers think up more reasons to allow themselves asymmetric special treatment than a smoker trying to quit. An apples-to-apples comparison will have no effect on them. But it will affect those not addicted to alternative facts. Para 3: “if anyone alleges contact between Russians and the target of an investigation, they should believed” – shoud be: “they should be believed,” right? Besides, *evidence* is so last year. “must be honored” “It is a fact, and you will not deny it,” Kascich, “like being on an airplane; you want to root for the pilot.” Note, not if it is flight 93. No wonder these witch-hunt start, now, Nato states Germany, Baltic will start a anti-Russia propaganda channel! EU is getting more and more paranoid and dangerous with this behavior. At what point, after it becomes apparent that the US will continue the current aggressive behaviour towards Russia (as predicted here: http://www.atimes.com/moscows-wriggle-room-shrinking-vis-vis-trump/) , at what point will the story of Trump being a Putin puppet and of Russia having ensured that Clinton be defeated be dropped? Or, since it arose without evidence, will it simply endure despite its obviously bearing no relationship to reality? For me, anymore, it’s seems very similar to the Obama Birth Certificate hysteria, which led to many, many court cases (wasting US taxpayer dollars on patented bullsh*t). Some citizens will go to their graves swearing that Obama was a secret Kenyan Muslim, who was illegitimate to be President. I fully expect that a similar contingency of citizens will believe to the bottom of their feckless gormless hearts that Trump is a total puppet of Putin & the Kremlin, the lack of evidence be damned. Propaganda in the Yew Ess Aay is very effective. The usual question is: Cui bono?